But ripped jeans are in style, you say! Perhaps. However, these jeans of Handy Husband’s are ripped in a rather unfortunate location. Do you get what I’m saying? The jeans aren’t really fixable in any way that says you should be wearing them to work for Casual Fridays. It’s not THAT casual! I need to throw them away or repurpose them. The repurposing issue is a challenge because most denim projects seem very dated or way too country western for me. I’ve lived long enough to know that if I procrastinate long enough wait awhile these projects will cycle back into style. However, patience is not one my virtues, so I’ve been challenging myself to come up with crafts using these denim jeans that seem acceptable for this decade. At Christmas, I wrapped some presents and made a name tag out of a strip of denim. I just wrote on the denim with a Sharpie marker. Super easy. 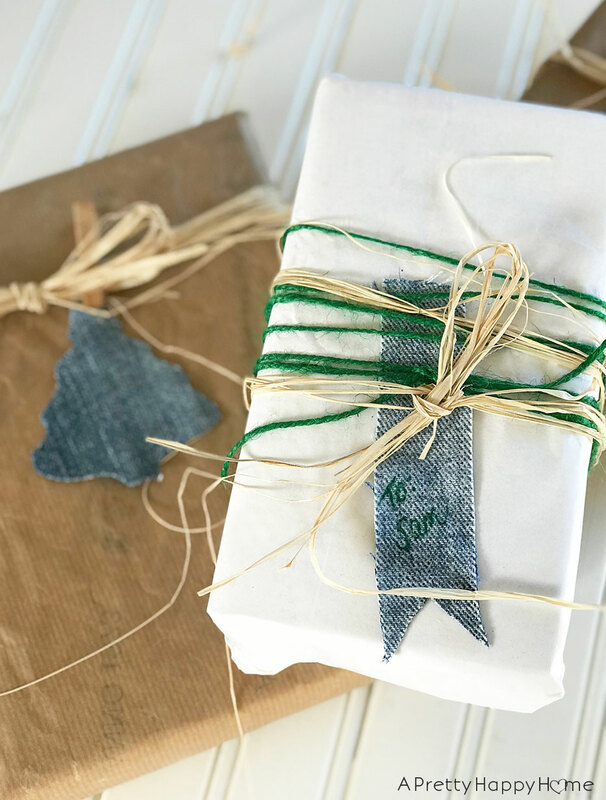 I liked the denim gift tag idea because it was different, unexpected and only took 10 seconds to do. I started thinking about pennants because a big college football game was in the news. 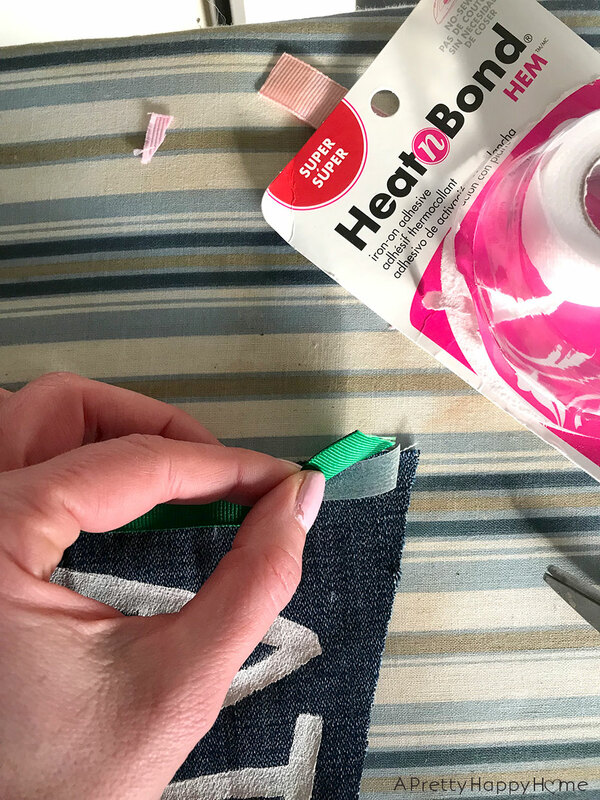 One thing led to another and I was cutting a pennant shape out of a pair of denim jeans. And, yes, cutting the pennant out required some math. So, kids, if you’re sitting in class wondering when you’re ever going to use geometry, let this be a cautionary tale lesson. 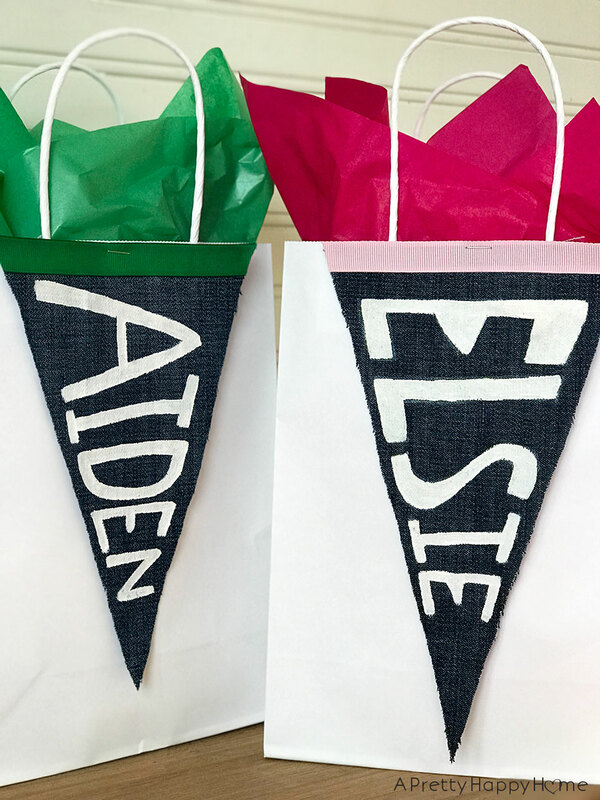 Instead of a school name, I wrote the gift recipient’s name on the pennant. I tried a paint pen first. That didn’t saturate the color as much I wanted. Maybe my pen was running out of paint? I switched to a fabric marker . That worked pretty well, except I only had a yellow marker, so it wasn’t bright enough for what I wanted. Finally, I switched to white fabric paint . The white paint provided a nice contrast with the dark denim. The trial and error part of this craft made the process not as quick the first time. I was cruisin’ by the time I made the second one though! 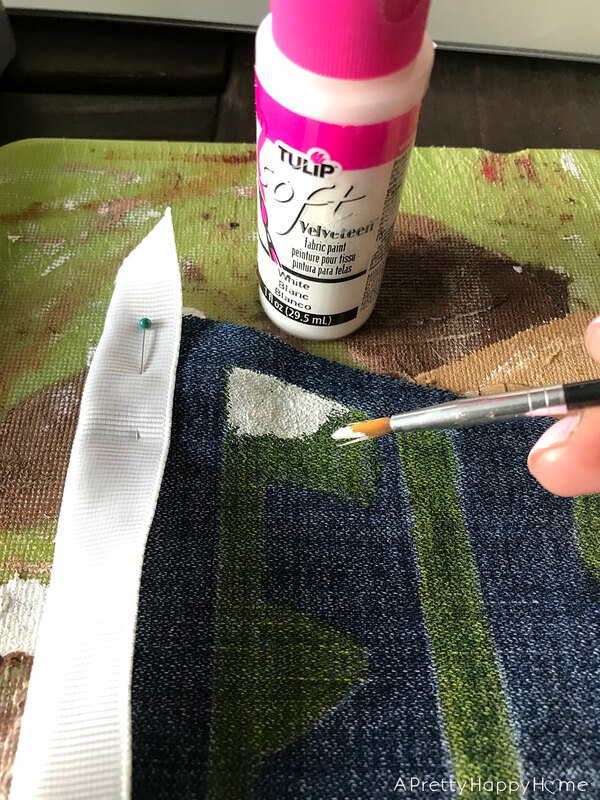 With the fabric paint method, I found it was easiest to first sketch the letters on with a pen and then paint over the lines with a small paintbrush. I just freehanded the letters. I decided to finish off the pennant with a strip of ribbon from my craft stash. You could glue the ribbon on with fabric glue . That was my original plan. Since I had my ironing board out for actual ironing (UGH), it was faster for me to just use a strip of iron-on hem tape to secure the ribbon. Do not get your iron too close to the fabric paint . It can cause it to warp a little. 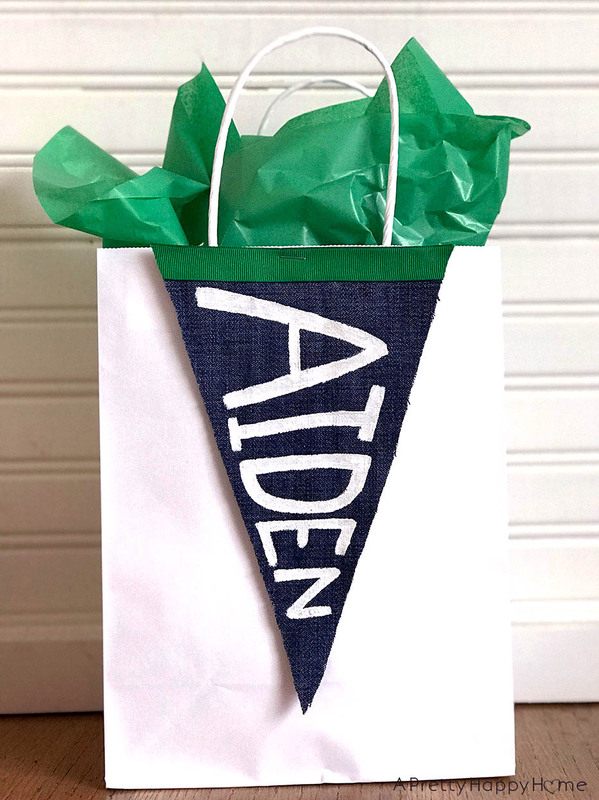 I debated on how to attach the pennant to a gift bag. In the end, I decided not to overcomplicate things (for once!) and just used a staple to attach it. If you’re putting the pennant on top of a wrapped present you could probably just use a few pieces of tape to secure it. 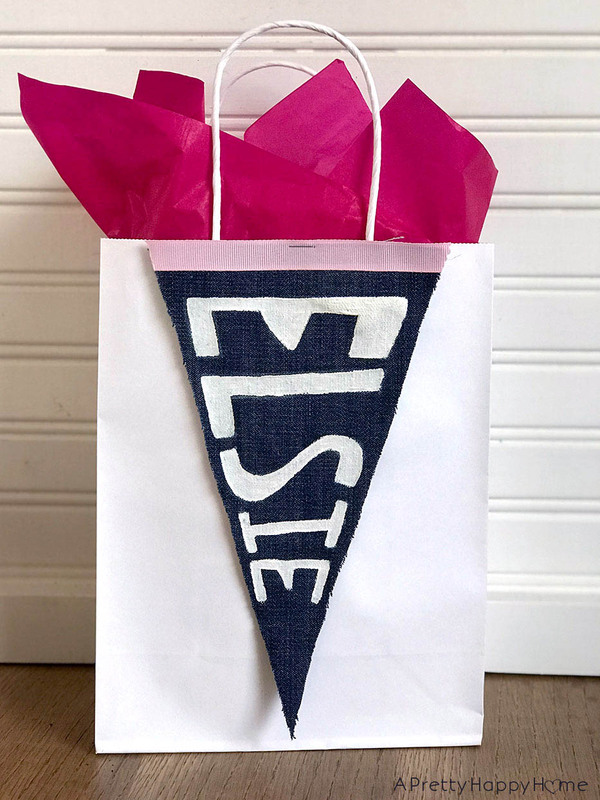 What I like about this gift topper is that if the recipient wants they can keep the denim pennant and hang it on a bulletin board. Or do whatever it is people do with pennants. If they don’t want to keep it – no biggie. I’m not particularly concerned with what happens to the present after it is gifted. These sorts of projects are fun for me. A way to relax and be creative. It’s a bonus if something useful or pretty comes out of the process. Ha! I think I might be done with denim pennants and other denim crafts for awhile though. Probably. Maybe. We’ll see. Very clever. I also wanted to comment on your trip to Luxembourg. 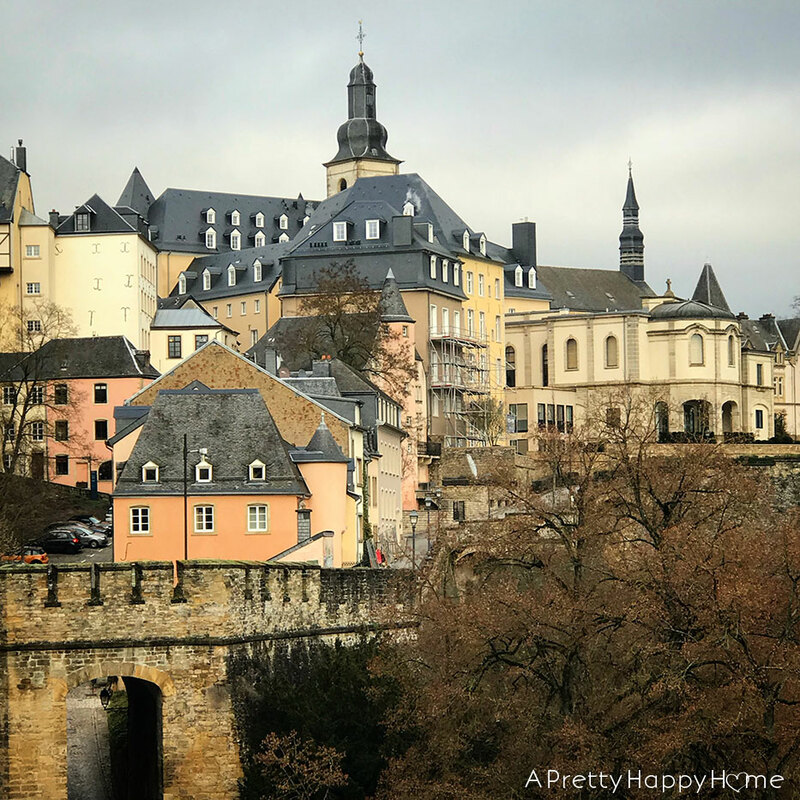 My sister and her husband traded houses with a lady who lived in Luxembourg. They live in Oakland, California. They spent several weeks there two summers in a row and really enjoyed it. They felt like they really got to know the city and enjoyed visiting different places. I have a Tee shirt they brought me from there. Oh my goodness! That is SO neat! I’ve always wondered about house trading. If you found the right person to switch houses with, it could be so neat!